Kyle Bigley began his drag racing career at the age of 10 and quickly rose through the ranks before graduating from the NHRA Junior Drag Racing League and moving to Super Comp. Son of well-known driver and crew chief Ed Bigley, Kyle competes in the Super Comp category of the NHRA Lucas Oil Drag Racing Series on a full-time basis. In 2018, Kyle captured the NHRA Division 1 Super Comp Championship in his first full season of competing in the class. In addition to the championship, Kyle accumulated a record 428 points securing a spot on the Division 1 Jegs Allstars team. Due to his stellar season, Kyle was also recognized as the Division 1 Driver of the Year. Thanks to many years of competition and on-track success paired with building the Bigley Motorsports brand, Kyle has become one of the prominent young drivers in sportsman drag racing. He has also earned a reputation of being one of the most recognizable and respected young competitors in the country. Kyle Bigley Motorsports is a professional drag racing team based out of West Milford, NJ. Bigley and his father Ed combine to campaign two purpose-built competition vehicles in drag racing events throughout the United States. Kyle virtually grew up at the race track with his father, watching and learning the sport of drag racing. Kyle first got behind the wheel and enjoyed a lucrative junior dragster career earning over 30 event wins, back-to-back track championships as well as winning the first ever $5,000 shootout at Bristol Dragway’s Eastern Conference finals…making him one of the most coveted junior dragster drivers in the nation before graduating to full size cars. At the age of 17, Bigley transitioned into the full-size ranks continuing his winning ways and success. Competing at the toughest track in one of the toughest divisions in the country, Bigley went on to many final rounds in his first season and finished 3rd overall in points, an impressive start for any 17-year-old. Kyle also competed in Super Comp at the NHRA divisional and national event level taking home the Numidia Divisional win in 2018 at his former home track. Along the way, Kyle played baseball, football, snowboarded and attended Penn State University earning his Bachelor’s Degree in Finance and Economics. Kyle opened the 2018 season at the second NHRA Division 1 Lucas Oil Drag Racing Series event of the season at Maple Grove. Kyle started his championship season by losing a close race in round one. After an early exit in his first event, Kyle’s championship run kicked off at his home track, Numidia Dragway. Since he bracket raced at Numidia frequently, Kyle was extremely comfortable at the event. After overcoming a water pump failure prior to round two, his father Ed, thrashed to have Kyle in the lanes in time to win the following round. Kyle eventually made his way to the final round where he met 2017 Division 1 champ Mike Robilotto. Bigley was impressive in the final with a .002 reaction and taking .002-second stripe to capture his first Super Comp win of the season. The team battled 100 degree temps at the next LODRS at Lebanon Valley. Although the heat was sweltering, Kyle battled to a semifinal finish to continue his march towards a championship. A week after the Lebanon event, the Bigley’s discovered an engine issue which necessitated a mid-season engine rebuild. 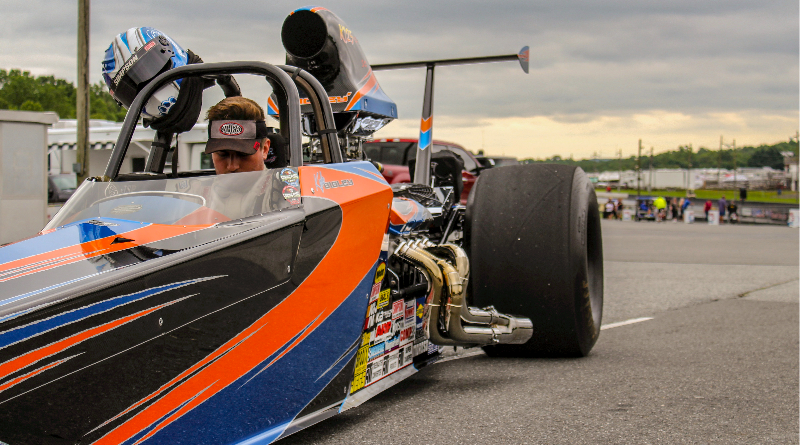 With a fresh engine, Kyle headed to Atco Dragway for the next Lucas Oil Series event. Kyle encountered his second early exit of the season after turning it red in round one. With the redlight behind him, Kyle posted a runner up finish at Cecil County followed by a win at Epping. The fourth round at Epping was a clash of the titans as Kyle lined up against fellow points contender Chris Garretson. Kyle took the win after Garretson had throttle stop issues causing an 8.49 breakout run. At Epping Kyle had luck when he needed it and was good when he had to be. The final win pushed him to a record 428 points and clinched the season championship. Career numbers 31 wins, 10 runner ups, 7.17 quickest ET, 186 top speed. After running just the dragster over the last years, the team decided to add a second car to the arsenal. Kyle and his father chose a 2002 MPR-built Super Stock Firebird for their assault on the 10.90 class. The car has “been bracket raced since we got it,” Kyle stated. “This off season we’re in the process of finishing up the Super Street build turning it into an electronics car and Super Street car. We have major sponsorship from BTE for the Firebird which includes numerous small parts, a transmission, and two torque converters. We’ll be representing BTE in the Northeast and are looking forward to a strong first season competing in Super Street,” Kyle acknowledged. For 2019 the Kyle Bigley Motorsports Team plans to run Super Comp and the Super Street Firebird. Like his dragster, the Firebird should be one of the fastest cars in the class. After running only one national event in 2018, look for Kyle at more nationals in 2019. Kyle hopes to continue his on-track success in 2019 by taking home a Division 1 Super Street Championship and Super Comp World Championship. You may also like this article on Jake Howard.